The vineyard’s mean age is 15-20 years, occupying an area of approximately 7,8 Km2, with an average yield of about 800 kg per each 0,001 Km2. The soil is volcanic with average composition (poor in calcium) and a low cup-shaped form; its basic plants are R110 (there are a few self-rooted plants, as well), while 15-20% of the vineyard is disease-free. The entire island constitutes a zone of Protected Designation of Origin for Muscat of Alexandria. 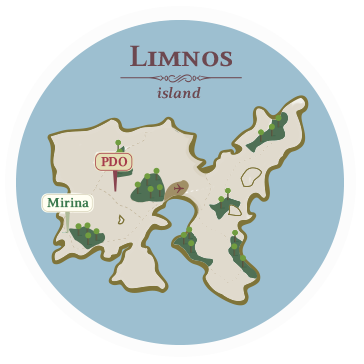 Another important factor for the unique quality aromas of Limnos’s single-variety wines is the surrounding vegetation, consisting of thyme and many different species of flowers, such as roses, that producers groom with care, since they are the best early indicators of upcoming mould and vine diseases. Grapevines are pruned short (1-2 spurs) and average yield is approximately 1000 kg per 0,001 Km2, or 3 kg per each trunk. Farmers show great care in managing the leaves during the vineyard’s vegetative cycle, taking advantage of the region’s prevailing north winds, thinning the shoots or the leaves whenever required, in order to avoid creating favorable conditions for the development of diseases. Harvesting begins at the end of August and lasts until the beginning or the middle of September.